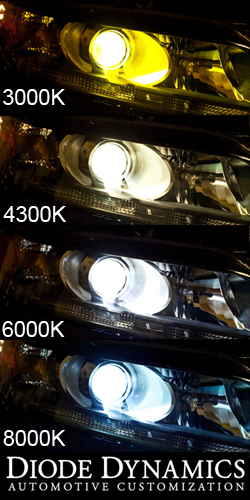 These are premium replacement Diode Dynamics 35w HID bulbs, from CNLight, the top brand in HID bulbs. The HID sizes offered come with standard connectors for use in an HID conversion kit. They do not include ballasts needed for full conversion of halogen lighting. Please purchase an HID Kit to convert your factory halogen headlamps into HID. Warranty: Do not be fooled by overrated warranties from other manufacturers and distributors. The warranty is only as good as what the company actually replaces. The warranty is through Diode Dynamics, LLC, so you can be assured that you will get fast and friendly service should you have any problems. These bulbs carry a full 1-year warranty for any defects or problems with operation.